2014 Division I NCAA Men's Swimming and Diving Championships held at the Lee and Joe Jamail Texas Swim Center at the University of Texas. 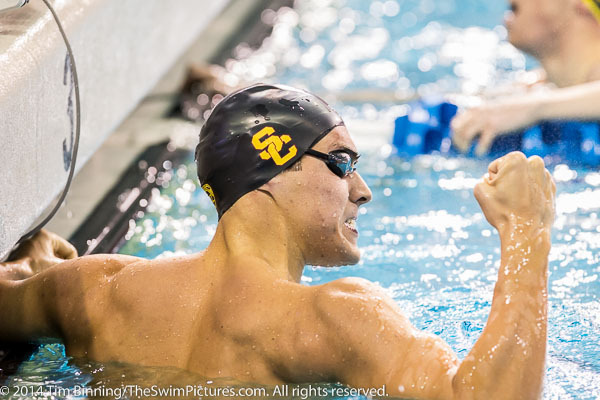 Cristian Quintero of USC wins the 500 freestyle on night one of the 2014 Division I NCAA Men's Swimming and Diving Championships held at the Lee and Joe Jamail Texas Swim Center at the University of Texas. 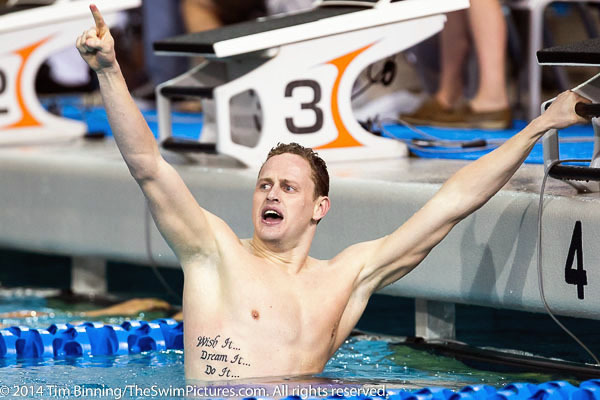 Florida Senior Marcin Cieslak Florida wins the 200 individual medley at the 2014 Division I NCAA Men's Swimming and Diving Championships held at the Lee and Joe Jamail Texas Swim Center at the University of Texas. 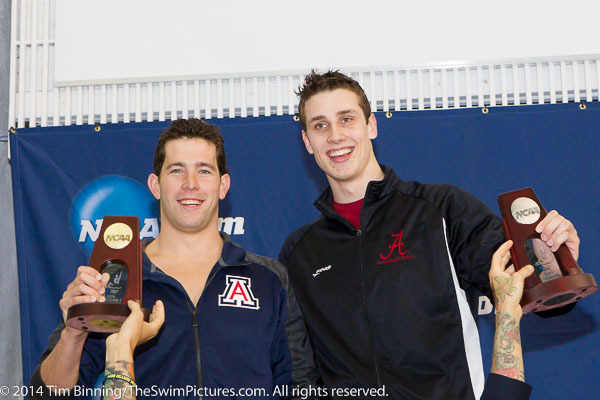 In the ' splash and dash' 50 free, Arizona Junior Brad Tandy and Alabama Freshman Kristian Gkolomeev tied for first place in 18.95 at the 2014 Division I NCAA Men's Swimming and Diving Championships held at the Lee and Joe Jamail Texas Swim Center at the University of Texas. 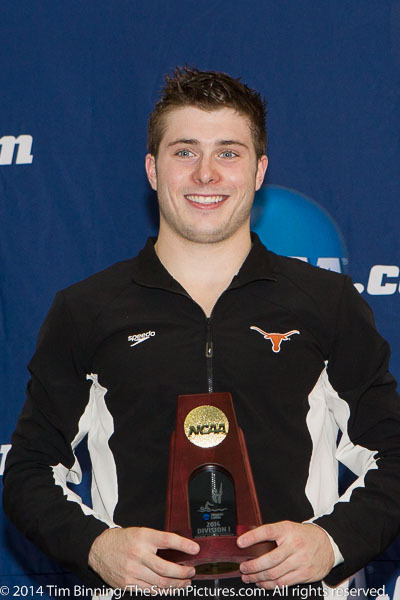 Texas Freshman Michael Hixon wins the 1 meter diving on night one of the 2014 Division I NCAA Men's Swimming and Diving Championships held at the Lee and Joe Jamail Texas Swim Center at the University of Texas. 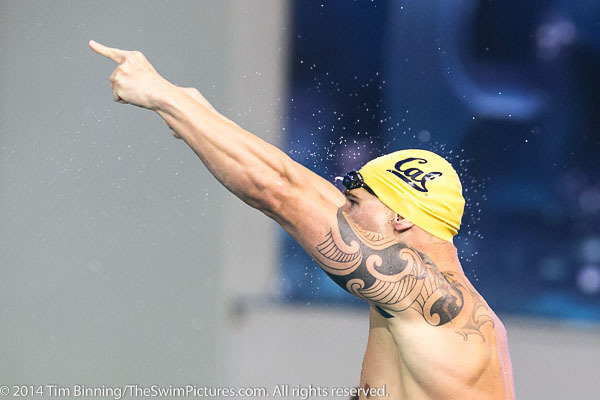 Cal Berkeley Senior Marcin Tarczinsky spreads his arms in a victory celebration after the 400 medley relay at the 2014 Division I NCAA Men's Swimming and Diving Championships held at the Lee and Joe Jamail Texas Swim Center at the University of Texas. 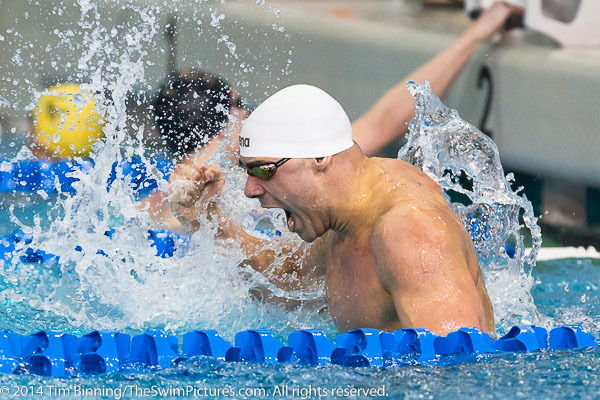 Cal Freshman Ryan Murphy (L) congratulates Senior Tony Cox after winning the 200 medley relay at the 2014 Division I NCAA Men's Swimming and Diving Championships held at the Lee and Joe Jamail Texas Swim Center at the University of Texas. 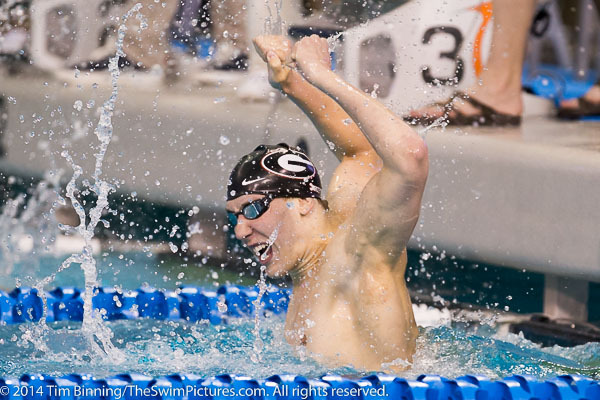 Georgia Sophomore Chase Kalisz repeats as 400 individual medley champion while setting a new American and NCAA record of 3:34.20 at the 2014 Division I NCAA Men's Swimming and Diving Championships held at the Lee and Joe Jamail Texas Swim Center at the University of Texas. 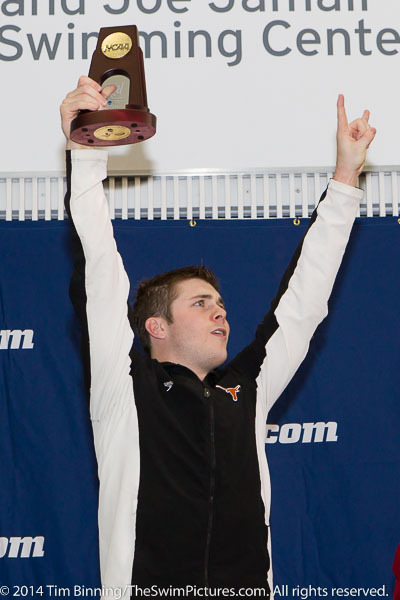 Marcin Cielsak, a Florida Senior, celebrates his 100 butterfly victory, his second individual win of the championships, at the 2014 Division I NCAA Men's Swimming and Diving Championships held at the Lee and Joe Jamail Texas Swim Center at the University of Texas. 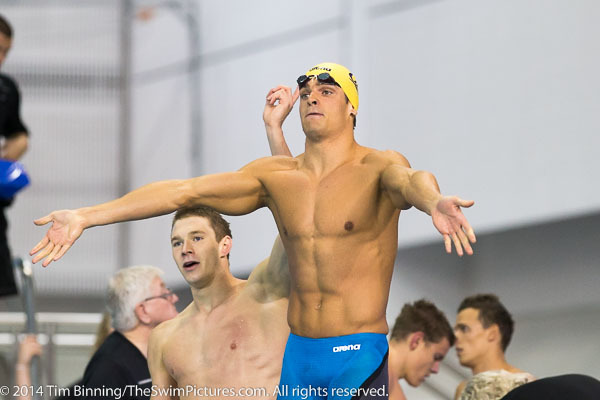 Louisville Senior Joao De Lucca repeats as 200 yard free NCAA champion at the 2014 Division I NCAA Men's Swimming and Diving Championships held at the Lee and Joe Jamail Texas Swim Center at the University of Texas. 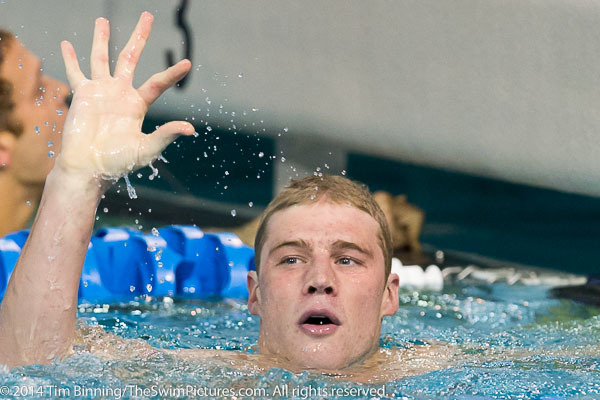 Arizona Junior Kevin Cordes sets a new American and NCAA record in the 100 breaststroke in winning the event at the 2014 Division I NCAA Men's Swimming and Diving Championships held at the Lee and Joe Jamail Texas Swim Center at the University of Texas. 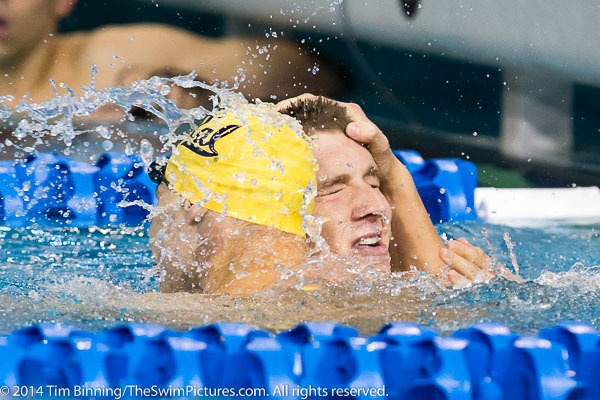 Cal Berkeley Freshman Ryan Murphy is congratulated by teammate Tony Cox after winning the 100 backstroke at the 2014 Division I NCAA Men's Swimming and Diving Championships held at the Lee and Joe Jamail Texas Swim Center at the University of Texas. 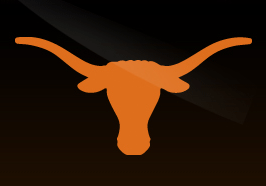 University of Texas Freshman Michael Hixon wins his second diving event, the 3 meter board, at the 2014 Division I NCAA Men's Swimming and Diving Championships held at the Lee and Joe Jamail Texas Swim Center at the University of Texas. 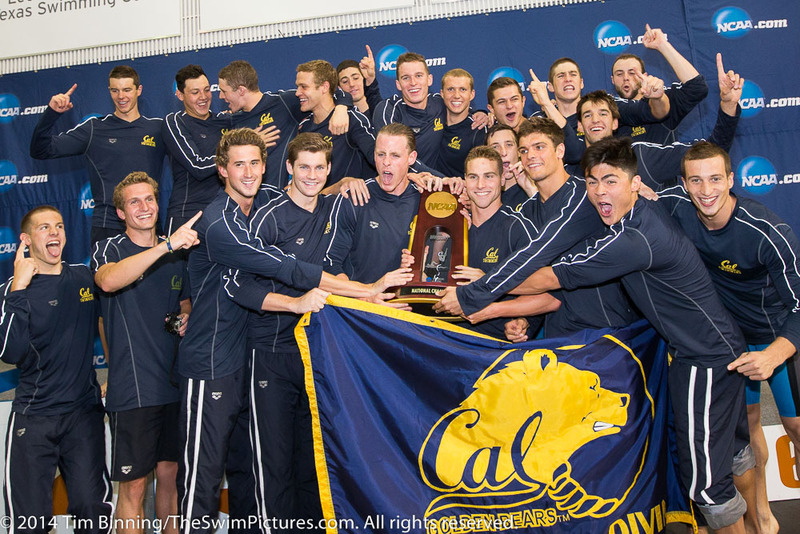 USC's winning 800 free relay team of Dimitri Calupaev, Cristian Quintero, Reed Malone and Dylan Carter celebrate their victory at the 2014 Division I NCAA Men's Swimming and Diving Championships held at the Lee and Joe Jamail Texas Swim Center at the University of Texas. 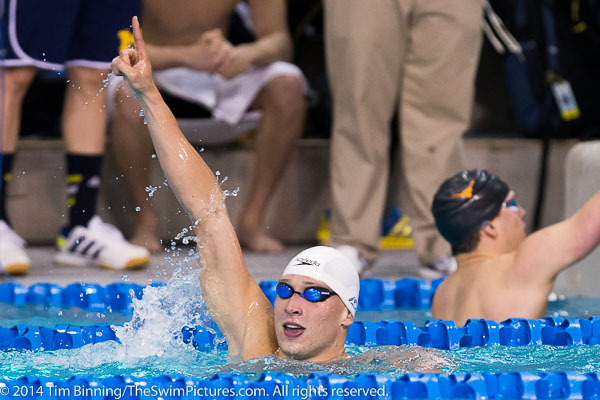 Michigan Senior Connor Jaeger repeats as 1650 champion at the 2014 Division I NCAA Men's Swimming and Diving Championships held at the Lee and Joe Jamail Texas Swim Center at the University of Texas. 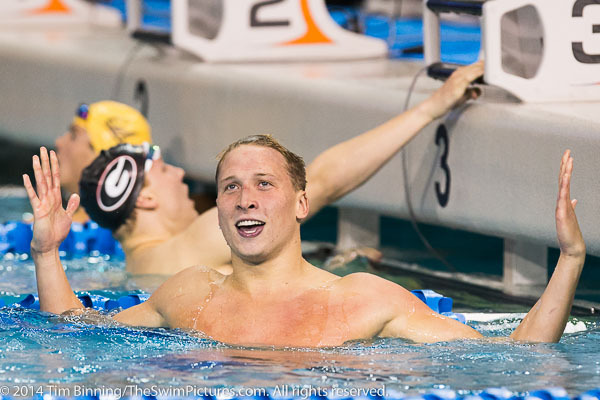 Cal's Ryan Murphy wins the 200 backstroke in an NCAA record time of 1:37.35, completing his sweep of the backstroke events at the 2014 Division I NCAA Men's Swimming and Diving Championships held at the Lee and Joe Jamail Texas Swim Center at the University of Texas. 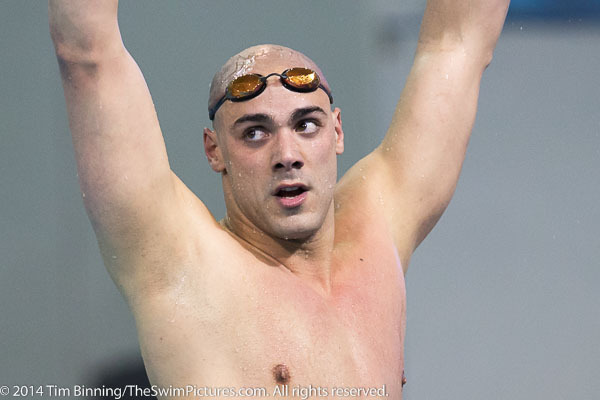 Louisville Senior Joao De Lucca adds to his 200 free victory with a win in the 100 distance at the 2014 Division I NCAA Men's Swimming and Diving Championships held at the Lee and Joe Jamail Texas Swim Center at the University of Texas. 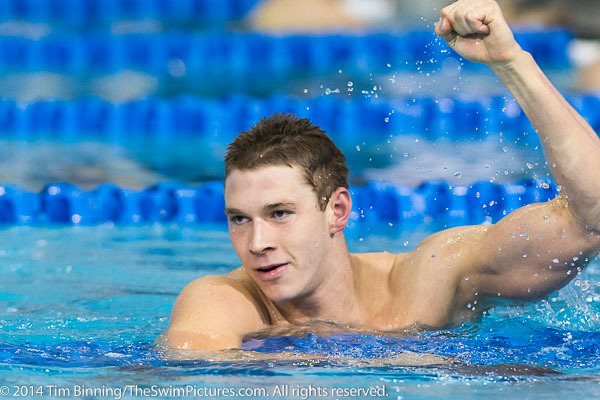 Arizona Junior Kevin Cordes lowers his own American and NCAA record in winning the 200 breaststroke at the 2014 Division I NCAA Men's Swimming and Diving Championships held at the Lee and Joe Jamail Texas Swim Center at the University of Texas. 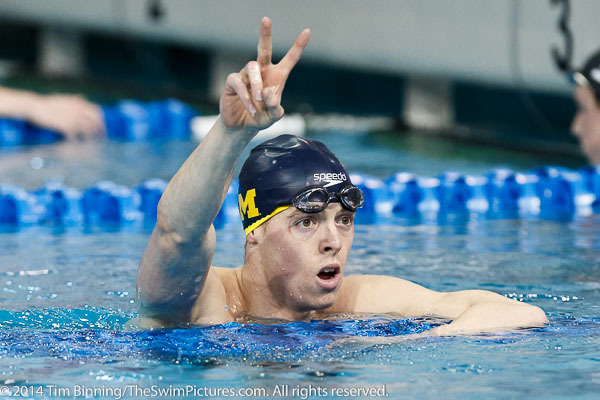 Michigan Sophomore Dylan Bosch lowers the NCAA and U.S. Open record in winning the 200 butterfly at the 2014 Division I NCAA Men's Swimming and Diving Championships held at the Lee and Joe Jamail Texas Swim Center at the University of Texas. 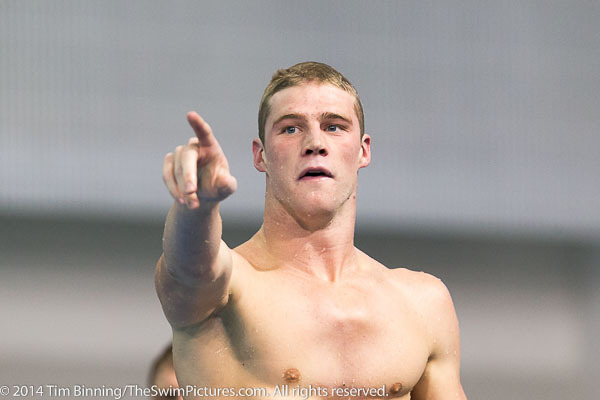 Duke Senior Nick McCrory wins platform diving to end a storied NCAA career at the 2014 Division I NCAA Men's Swimming and Diving Championships held at the Lee and Joe Jamail Texas Swim Center at the University of Texas. 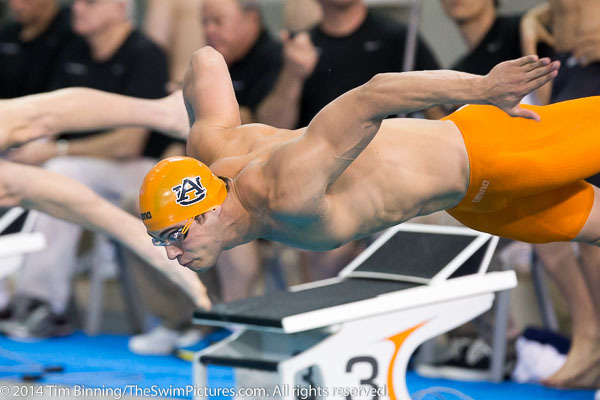 Auburn Senior Marcelo Chierighini led off the team's successful 400 free relay at the 2014 Division I NCAA Men's Swimming and Diving Championships held at the Lee and Joe Jamail Texas Swim Center at the University of Texas.